It's not quite dinner, but it's not just drinks: the high-concept Overproof bar-inside-a-bar is a new hybrid on the San Francisco food scene. The idea is this: you buy a ticket (transferable but not refundable) for a 5-drink, 5-dish theme cocktail experience. The dishes are meant to be shared and are not huge, but we did not leave hungry. The cocktails are also a little smaller than the normal size, but we did not leave sober either. For fine-dining value it can't be beat: $60 a person, plus tax, ticket fees and tip. Overproof is inside ABV, already one of the country's best cocktail bars, both for its fine cocktails and its elevated bar food. You can and should just walk into ABV and have a drink and some grilled octopus and fries. Overproof, on the other hand, is booked out weeks in advance. We were invited by a PR firm but they didn't have an opening for nearly two weeks, and we ended up with a 9 pm seating. Pro tip: the 9 pm show has the advantage that you are not rushed to leave. Our tablemates had come to Overproof before at a 7 pm seating and mildly complained that they were hurried out the door. That said, they bought tickets for the second iteration of Overproof as soon as they went on sale. The first iteration of Overproof offered rum-based drinks. Currently, it's all about whiskey, with 5 whiskey-based drinks and an interior theme that is meant to look like a cozy Tokyo izakaya. We sat under a samurai sword (real metal, but we didn't test the sharpness) and perhaps its implicit threat worked to keep anyone from chugging a shot of some of the Pappy Van Winkle on the library-like shelves. The five cocktails are a diverse group. The Drifter is a light, bitter opening. You only taste Suntory Toki whiskey in the attack; the finish is all Amaro Nonino (there's also Dolin Blanc vermouth). It seems an unusual choice for an aperitif cocktail but I'm a big amaro fan so I was happy with it. The dish served with it, a Tsukune Scotch Egg, was my favorite of the night: chicken tsukune (chopped fine, reformed into a ball and grilled) wrapped around a soft-boiled egg. The tsukune is so salty that my lips tingled, but that works as bar food. I was just a little surprised not to see an obvious combo of Scotch with a Scotch egg. Neither my wife nor I nor our neighbors finished the High Plains Highball, which was boring: again, Suntory Toki whiskey is so mild that you barely taste it over the 24-hour cold-steeped genmaicha (brown rice green tea). We loved the slightly spicy avocado and seaweed salad with it, though: the sea beans stood out for their freshness. 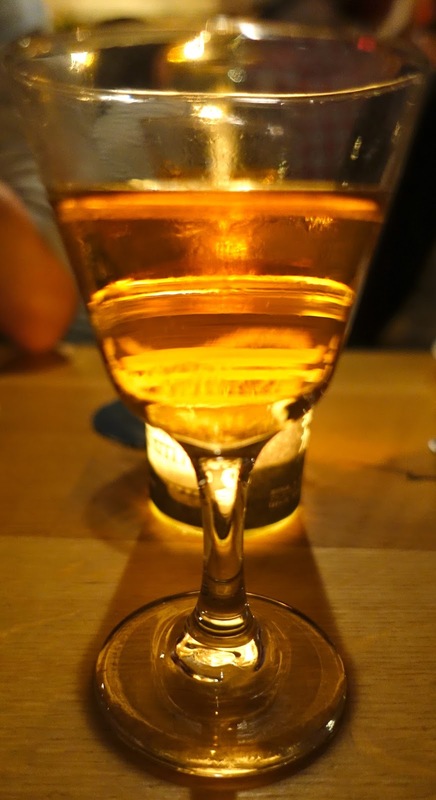 My favorite drink was the Golden Gai, a Manhattan variant with Willett 3-year rye, plum liquor and Angostura bitters. I make a lot of Manhattan variants but had never thought to substitute plum liquor for Vermouth; the result was a smoother and richer texture. This came with a dish my wife adored: a ramen egg in very legitimate Japanese clear porcini-dashi soup. Not only was it delicious; it's a good idea to give people some non-alcoholic liquid when they're drinking five cocktails. The Longblood looks like rosé wine and smells and tastes like sparkling Scotch. It's made from Longrow peated Scotch, house-made orange shrub and fresh lemon juice, and it's carbonated. My wife is not usually a peat fan but she said, "I love this. Rosé and refreshing. After three cocktails it feels stimulating." We were not fans of the celery root agedashi, which was too heavy for us, but our neighbors were happy to have the ballast because they hadn't eaten in 10 hours, which doesn't seem wise before Overproof (we prepped by having a snack at 5 pm). The final food item comes out before the final cocktail: koji-marinated hangar steak, daringly rare, with lots of green garlic. I liked it in theory but it wasn't a dish I wanted after four cocktails; this would have been a good time for more cooked food, and I say this as a guy who eats a lot of stuff raw. But the final cocktail was a terrific digestif. The Red Eye is made with Mosswood espresso-barrel finished Bourbon, Campari, Tempus Fugit creme de cacao, orange fennel bitters and smoked coffee bitters. The aroma is mostly Campari but it has a nice rich espresso flavor and a long finish. It's a nice play on the idea of having an espresso after a meal. San Francisco offers a lot of unique dining experiences these days, but even in a jaded food city, Overproof is interesting. 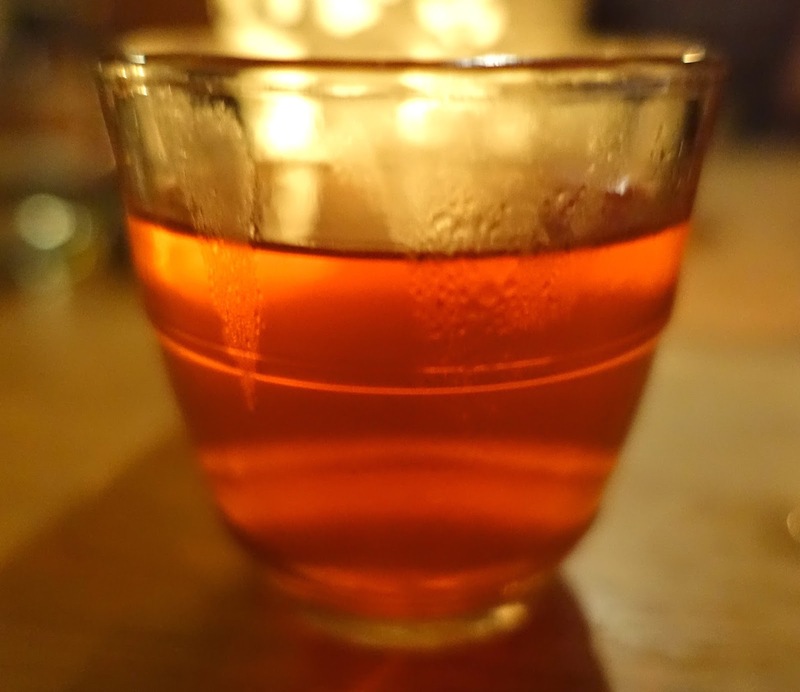 Where else can you get pink sparkling Scotch -- and like it? Buy tickets to Overproof here.